Isma'il Haniyeh and Yahya al-Sinwar meet with the members of the Egyptian delegation (Facebook page of Shehab, October 1, 2017). 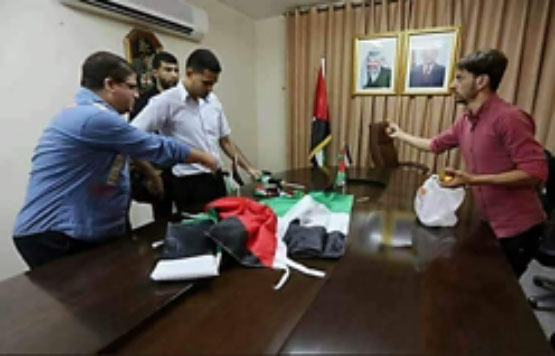 Preparations at Mahmoud Abbas's house in the Gaza Strip for the Palestinian government meeting (Palinfo Twitter account, October 1, 2017). Palestinian Prime Minister Rami Hamdallah holds a press conference on the Palestinian side of the Erez crossing upon his arrival in the Gaza Strip (Facebook page of Shehab, October 2, 2017). Yahya al-Sinwar, head of Hamas' political bureau, meeting with young Palestinian in the Commodore Hotel in Gaza City (YouTube, September 29, 2017). 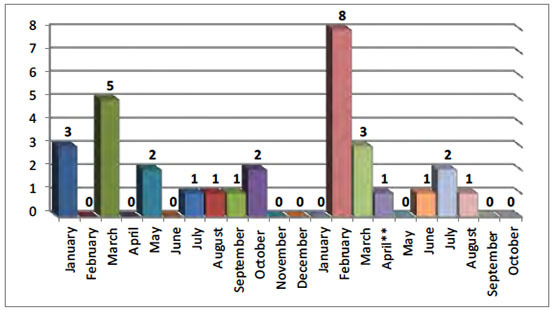 This past week no significant terrorist attacks were carried out in Judea and Samaria. The Israel-Gaza Strip border was quiet. Israeli security forces detained three Israeli Arabs from the central Arab city of Umm al-Fahm on suspicion of planning a shooting attack on the Temple Mount. Investigation revealed they support ISIS’s ideology. Two guns and ammunition were found in their possession. On October 2, 2017, a delegation of members of the Palestinian national consensus government headed by Prime Minister Rami Hamdallah entered the Gaza Strip through the Erez crossing. The delegation will deal with transferring governmental authority to the PA, including authority over the crossings and control of the security forces. 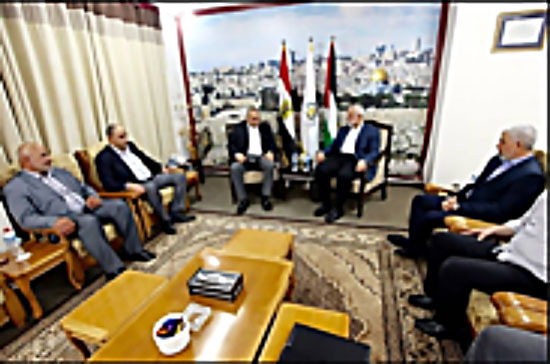 Hamas spokesmen strongly reiterated their support for the transfer of authority, but at the same time made it clear that they would not allow any change in the status of their weapons (“the [so-called] weapons of the resistance”). Their statements indicate that the real power in the Gaza Strip will remain in the hands of Hamas, even if governmental authority will ostensibly be transferred to the national consensus government. 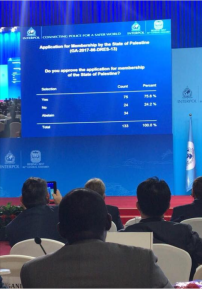 The Palestinian Authority (PA) was accepted as a full member of INTERPOL. The PA praised the decision and represented it as a “great victory.” Palestinian figures said joining INTERPOL would allow the Palestinians to “pursue” [so-called] Israeli war criminals and senior Israeli figures. October 1, 2017 – Israeli security forces operating in the Palestinian village of Bani Na’im (Hebron region) located four rifles, optical equipment, a metal detector and ammunition (Facebook page of Red Alert, October 1, 2017). September 30, 2017 – A Molotov cocktail was thrown at an IDF post in Mt. Hebron. There were no casualties. A search was carried out to locate the terrorists (Facebook page of Red Alert, September 30, 2017). September 29, 2017 – Shots were fired from light arms at an IDF post in Beit El. There were no casualties and no damage was reported. (Facebook page of Red Alert, September 29, 2017). September 29, 2017 – Palestinians threw stones at IDF forces operating in the region of al-Aroub in Gush Etzion. An IDF soldier was injured (Facebook page of Red Alert, September 29, 2017). September 28, 2017 – Palestinians placed two IEDs between Beit Fajjar and the Etzion Industrial Park. The two Palestinians were detained by the Israeli security forces and taken for interrogation (Facebook page of Red Alert, September 28, 2017). September 28, 2017 – A Palestinian staying in Israel illegally was detained by the Israel Police at a construction site in Tel Aviv. During interrogation he said he was planning to use buy a knife to carry out a stabbing attack (Facebook page of Red Alert, September 28, 2017). The Israeli security forces detained three Israeli Arabs from Umm al-Fahm, one of them a minor aged 16. They were detained on suspicion of planning to carry out a shooting attack on the Temple Mount similar to the one carried out on July 14, 2017, in which two Israeli policemen were killed (residents of Umm al-Fahm were also involved in that attack). Investigation revealed that a short time after the July attack two of the detainees, one of them 16 years old, planned a shooting attack on the Temple Mount. They surrendered the two guns and ammunition they were planning to use. During interrogation they admitted supporting the ideology of ISIS, which was their motive for planning the attack. In the house of the third detainee, who is also an ISIS supporter, the police found a Carl Gustav submachine gun (Israel Security Agency website). The Gazan electric company reported that electricity is now supplied to the residents of the Gaza Strip in cycles of four hours with electricity and 12 hours without. That is because one of the Egyptian power lines supplying electricity to the Khan Yunis and Rafah regions is non-operative (Dunia al-Watan, September 27, 2017). UNRWA reported it had received a $10.2 million donation from Japan for the Palestinian refugee camps. According to the agency, $3.7 million will be allotted to the refugee camps in the Gaza Strip (quds.net, September 27, 2017). 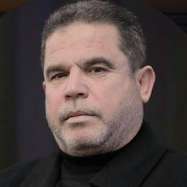 The Palestinian media reported that Salah al-Bardawil, a member of Hamas’ political bureau who is also a Hamas spokesman and the owner of al-Aqsa TV, ended his role as director of the channel. According to the report, he will be replaced by Wassam Afifa, who today is editor-in-chief of alresala.net (al-Quds, September 30, 2017). It is currently unclear why Salah al-Bardawil has stepped down. He may be a candidate for the position of head of Hamas’ information bureau (Madar News and Sawt Fatah, September 30, 2017). Sadiq al-Sur, head of the department of investigations in the Libyan attorney general’s office, said Libya had apprehended four Hamas operatives who smuggled weapons to Egypt and revealed security information. Initially the four operated out of Benghazi and later moved to Tripoli, where they were caught (al-Watan, September 28, 2017). 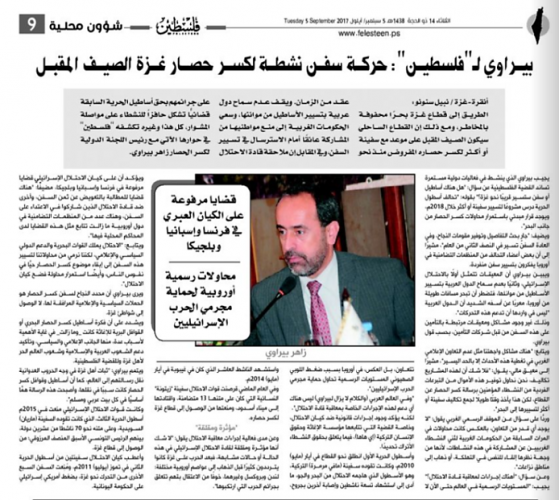 Hamas spokesman Fawzi Barhoum denied the statement issued by Sadiq al-Sur. He claimed Hamas has a firm policy of not meddling in the affairs of the Arab states or any other country. He claimed all of Hamas’ attention was exclusively directed at “Palestine” and the struggle against Israel. He called for the end of the spreading of such “lies” (Hamas website, September 29, 2017). 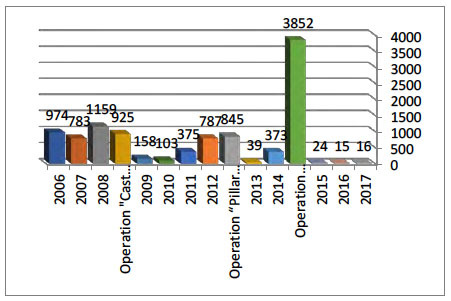 A news agency based in the Gaza Strip affiliated with Hamas reported that the Freedom Flotilla Coalition has begun making preparations for a new flotilla consisting of a number of ships. They will leave from Cyprus and sail to the Gaza Strip in an attempt to break the so-called “siege.” Preparations reportedly began about seven months ago and the flotilla is supposed to set sail at the beginning of 2018 (Shehab, September 28, 2017). Zaher Birawi, a Palestinian operative in Britain affiliated with the Muslim Brotherhood and Hamas, was recently interviewed by Hamas’ newspaper Felesteen. He discussed the many difficulties involved in launching flotillas to the Gaza Strip, although he tried to minimize their importance. Birawi admitted that the main goal of the flotillas is propaganda, to keep the Palestinian cause in the Gaza Strip and the “siege” alive in international public discourse. He also admitted that the flotillas are meant to defame Israel and give greater voice to the political and media campaigns accompanying them. Hamas and the PA have both been guardedly optimistic about the reconciliation agreement. In preparation for members of the national consensus government to visit the Gaza Strip, a delegation of the PA presidential guard has already arrived. The delegation met with representatives of the Hamas ministry of the interior, the minister of public works and officers in the various security forces. They discussed preparations for the visit, primarily the measures that would be taken to secure the government members. Iyad al-Bazam, spokesman for the ministry of the interior in the Gaza Strip, said that the security forces in the Gaza Strip had completed preparations for ensuring their safety. Security force operatives have been deployed in the streets, at the main junctions and near government installations to guard the delegation’s arrival at the designated sites (alresalah.net, October 1, 2017). Right: A delegation of PA security force operatives, headed by minister of housing Mufeed Hasayneh, meets with Hamas security force operatives in the Gaza Strip (Palinfo Twitter account, September 29, 2017). Left: Security forces deploy to guard the arrival of the Palestinian national consensus government in the Gaza Strip (Facebook page of Shehab, October 1, 2017). In the meantime, a delegation of senior Egyptian figures arrived in the Gaza Strip, including Hazem Khairat, the Egyptian ambassador to Israel, and members of Egyptian General Intelligence (Filastin al-Yawm, October 1, 2017). They entered the Gaza Strip through the Erez crossing, and their objective will be to supervise the transfer of government ministries to the ministers of the national consensus government (Facebook page of Shehab, October 1, 2017). The Palestinian media reported that Khaled Fawzy, the Egyptian minister of intelligence, will arrive in the Gaza Strip on October 3, 2017, along with the governor of the Sinai District (Ma’an, October 2, 2017). Members of the delegation have already met with Isma’il Haniyeh and Yahya al-Sinwar (Dunia al-Watan, October 2, 2017). 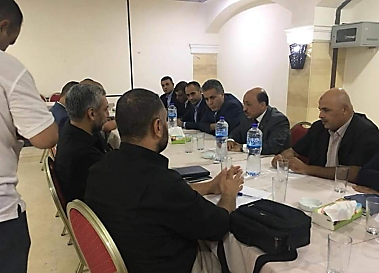 Yahya al-Sinwar, head of Hamas’ political bureau in the Gaza Strip, met with the administrative committee and deputy ministers to update them on the decisions made to promote the reconciliation. He strongly urged them not to interfere with the workings of the ministries in any way (al-Quds, September 27, 2017). As part of the reconciliation and the understandings reached, the ministry of the interior in the Gaza Strip announced the release of several Fatah prisoners (Palinfo, October 1, 2017). During the weekly government meeting in Ramallah, Rami Hamdallah, prime minister if the national consensus government, said several ministerial committees had been appointed for transferring to the government the control of the border crossings, the security forces and various government institutions. He added they would also include the ministries dealing with matters of citizenship, administration and the law. In addition, reportedly a national team has been appointed to implement the reconciliation in the Gaza Strip. It will include a number of ministers from the national consensus government, among them the minister of the treasury and planning, the minister of local administration, head of the real estate authority and the head of the land and water authority (Wafa, September 26, 2017). On October 1, 2017, the national consensus government held an ad hoc meeting in Ramallah before the delegation left for the Gaza Strip (quds.net, October 1, 2017). According to the Lebanon-based newspaper al-Hayat, Mahmoud Abbas set three conditions for the reconciliation: the end of the intervention of Qatar, various states and others in the affairs of the Gaza Strip; rejection of the Lebanese “Hezbollah model,” that is, having the national consensus government ostensibly in power while in reality Hamas rules the Gaza Strip; and that any and all support and donations to the Gaza Strip will only be handled by the national consensus government (al-Hayat, September 29, 2017). At noon on October 2, 2017, the national consensus government delegation headed by Rami Hamdallah entered the Gaza Strip through the Erez crossing. Hamas spokesman Taher al-Nunu said Hamas has three objectives: to restore the public’s faith in the government that represents it, to lift the sanctions imposed on the Gaza Strip, and to create equality for all the Palestinian people, regardless of political affiliation (al-Aqsa, October 1, 2017). 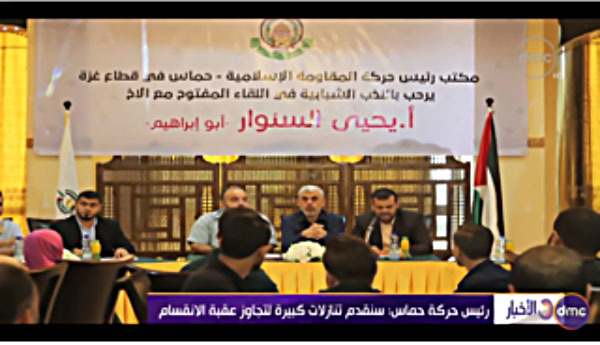 Isma’il Haniyeh, head of Hamas’ political bureau, told the residents of the Gaza Strip that Hamas intends to base the reconciliation on uniting the West Bank and the Gaza Strip. 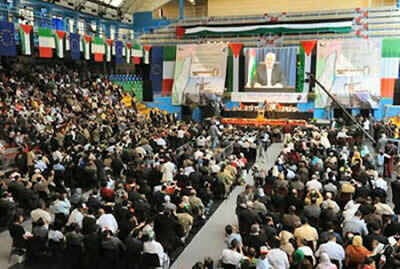 He claimed Hamas put the internal Palestinian reconciliation at the top of its priority list. He claimed he expects Fatah to cooperate in the process and that the national consensus government will once again operate in the Gaza Strip (Hamas website, September 30, 2017). Meeting with young Palestinians in Gaza City, Yahya al-Sinwar said Hamas is willing to make “significant and surprising” concessions to end the rift and achieve a reconciliation. He claimed Hamas made a “strategic choice” from which it will not retreat, and that it will “break the neck” of anyone who does not agree. He also claimed that Muhammad Deif, head of Hamas’ military wing, supports the reconciliation (Shehab, September 28, 2017). Senior Hamas figure Musheir al-Masri said the Palestinian people have entered a new era and that Hamas is giving its heart and hand to the national consensus government so that it will do everything possible to support the Palestinian people. He added that with Egyptian sponsorship, there has to be a comprehensive dialogue with all the organizations, not only with Hamas and Fatah. He also said that the national consensus government is an interim government and will be replaced when a permanent government is formed (al-Aqsa, October 1, 2017). In the meantime, the senior Hamas figures emphasize that as part of the reconciliation, the issue of the weapons of the “resistance” [i.e., Hamas and other terrorist organizations] will not be discussed. Khalil al-Haya, deputy head of Hamas’ political bureau in the Gaza Strip, said that Hamas will not interfere in the workings of the national consensus government in the Gaza Strip, but that Hamas will not allow anything to happen to the weapons of the “resistance” (al-Jazeera, September 27, 2017). Musa Abu Marzouq, a member of Hamas’ political bureau, stressed that the weapons of the “resistance” will not be discussed at any meetings, not in the past and not in the future (al-Anadolu September 27, date, 2017). Such declarations indicate that the real power in the Gaza Strip will remain in the hands of Hamas, even if ostensibly authority will be restored to the national consensus government. 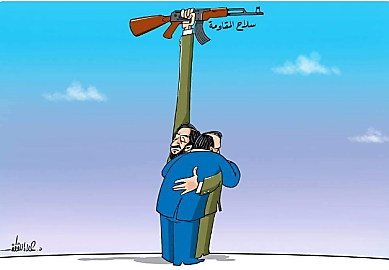 Hamas cartoon stressing that it will not lay down its arms. The Arabic reads, “The weapons of the resistance” (Palinfo Twitter account, September 30, 2017). Three days after the shooting attack at Har Adar, in which three Israelis were killed, the PA issued a half-hearted condemnation, relating not exclusively to the Har Adar attack but rather to “all acts of violence” (an often-used PA media tactic). The condemnation was not personally stated by Mahmoud Abbas but by Nabil Abu Rudeina, spokesman for Mahmoud Abbas, who said that “the position of Chairman Abbas is always to condemn acts of violence, including the current one [Har Adar], and to condemn acts of violence [regardless of] their source (Ma’an and Dunia al-Watan, September 29, 2017). 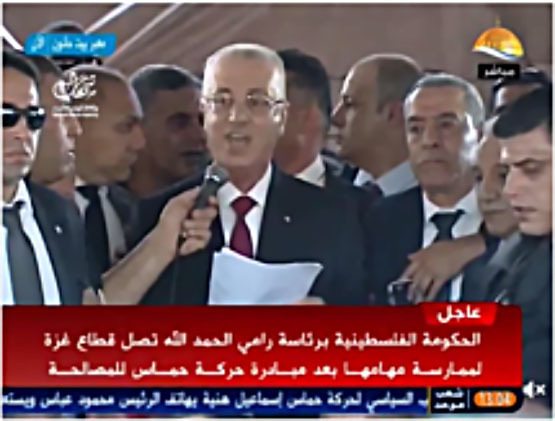 Rami Hamdallah, prime minister of the national consensus government, said it reflects the broad international support to accept “Palestine” as an independent state. It also shows the failure of Israel’s attempts to undermine the Palestinians activities in the international arena (Wafa, September 27, 2017). Riyad al-Maliki, foreign minister of the national consensus government, said that by joining INTERPOL the PA established its legal status. He said now the Palestinians would benefit in various ways, including being able to form relations with other countries and join other agencies. 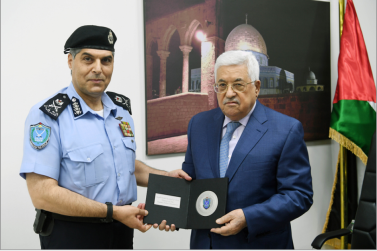 He said the Palestinians would establish a special administration in the Palestinian INTERPOL connected to the ministry of the interior and police stations. The administration will liaise with the rest of the world and international INTERPOL. He said if someone in the PA wanted to detain a criminal, they could lodge the request with the international INTERPOL which would be responsible for detaining the person and transferring him to whoever wanted him detained (Palestinian TV, September 30, 2017). Shawan Jabarin, head of al-Haq, claimed that by joining INTERPOL, the Palestinians could pursue Israeli war criminals and senior Israeli figures in accordance with the level of their responsibility for carrying out the so-called “war crimes” against the Palestinian people. He claimed there was a link between joining INTERPOL and the Palestinians suits brought before the International Criminal Court (ICC) in The Hague. That is because the PA could now ask for the extradition of ordinary criminals as well as war criminals, regardless of whether the crime was committed in the Palestinian territories or in another country, a hint at activities carried out against Palestinians in Lebanon. (Madar News, September 27, 2017). An anonymous source in Mahmoud Abbas’ office reported that the PA will give INTERPOL a list of wanted men, headed by Muhammad Dahlan and two of his close aides. The source claimed one of the reasons the PA wanted to join INTERPOL was to pursue people convicted by the Palestinian justice system who had fled to other countries (Middle East Eye, September 29, 2017). Senior Fatah figure Jamal al-Tirawi said that according to Palestinian law, matters related to Dahlan could not be turned over to INTERPOL because the organization would not intervene in internal differences of opinion (al-Ghad, October 1, 2017). The Turkish foreign ministry congratulated the PA on becoming a full member of INTERPOL, saying that Turkey will continue to support the Palestinians in their efforts to receive their rightful place in international agencies (al-Anadolu News, September 30, 2017).